Having been made redundant in 2009, I had to make a decision about my future. Was I going to look for another job in an office or should I throw caution to the wind and do something that I really wanted to do? I had worked in an office for over 30 years so changing to something I'd never done before, with no certainty of income, nor any idea if I'd be any good at it: it was a major decision. But with a lot of encouragement from my husband and friends and a reasonable redundancy package I decided to give it a go. I've never looked back since and just wish I had been given this opportunity years before. 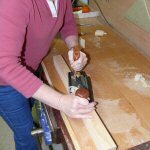 I trained for a year with John Lloyd, a well-respected and experienced cabinetmaker based in Sussex. There were times when, being the only female in the workshop, I felt a bit like a fish out of water, but in truth that year was probably the best one of my life. I learned so much, from sharpening tools to creating delicate dovetails; from laying veneer to designing a piece of furniture! Cabinet making is what I should have been doing all of my working life and not just for the last few years of my working life. I love it, every aspect of it. I am naturally a very impatient person, but when I am working on a piece of furniture patience doesn't come into it, I have to do it right, no matter how long it takes. I am amazed at the amount of time I am willing to put in to make sure that a piece I am working on is as perfect as possible.